The official trailer of Bahubali 2 Movie is released recently. Soon we will be getting the answer that Why did Kattappa killed Bahubali? However, if you are looking for the answer that which Bahubali shares will give good returns in the future? I am here with the detail of Bahubali – Multibagger Shares that are fundamentally strong and likely to give good returns in the future. The detail of these multibagger shares is taken from CNBC Awaaz special program telecasted recently. 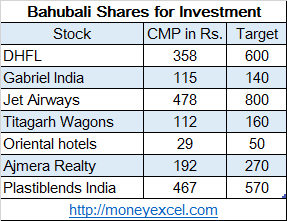 So, here are Bahubali shares for investment in 2017. The first bahubali multibagger stock for the investment is Dewan Housing Finance. Dewan Housing finance is a midcap stock with the good potential to become large cap in the future. Dewan Housing finance is in the business of housing finance in middle and lower class segment. Upcoming affordable housing schemes project will surely boost earning levels of this company. The company has good fundamental and future business opportunities. You can invest in the stock with target price of Rs.600. Gabriel India is next bahubali pick for the investment in 2017. Gabriel India is in the business of automotive components. Gabriel India is zero debt company. Gabriel India is a supplier of almost all major manufacturer like Maruti, Tata Motors, Ford, GM, Toyota, M&M etc. Gabriel’s presence across all segments of the auto industry is an added advantage. You can invest in the stock with target price of Rs.140. The next bahubali stock pick is Jet Airways from the aviation industry. Jet Airways is a leader in the aviation industry and hold almost 20% market in the aviation sector. India’s leading stock market investor Rakesh Jhunjhunwala is also holding stock of Jet Airways. Jet Airways is very good stock. You can invest in the Jet Airways with a target price of Rs.800 in next two years. Titagarh Wagons is another bahubali stock pick. Titagarh Wagons is in the business of making wagons, bridges and heavy earth moving equipment. The company has very good order book. Looking at upcoming metro train projects in multiple cities company is expected to get good business in the future. You can invest in the Titagarh Wagons with a target price of Rs.160. Oriental hotels is next bahubali share on the radar. Oriental hotels in the hotel business. Oriental hotels is undervalued stock available at good price. The company is holding multiple assets at different places. You can invest in the stock with target price of Rs.50. Ajmera Realty is next multibagger stock pick. Ajmera Reality is real estate Company with good presence in the metro cities like Mumbai, Bangalore and Ahmedabad. It is nearly zero debt company. The financial performance of the company is very good. The affordable housing boom is likely to help this company in the future. You can invest in the stock with target price of Rs. 270. Plastiblends India is another bahubali stock for the investment. Plastiblends India is in the business of manufacturing of color & material used in the plastic processing industry. The company has a strong footprint in the global market. It is recommended stocks for investment with a target price of Rs.570. 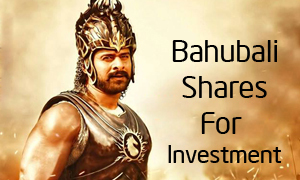 Do you think that these Bahubali shares will outperform in future?